Solution Tender: If someone hurts you, betrays you, or breaks your heart forgive them. 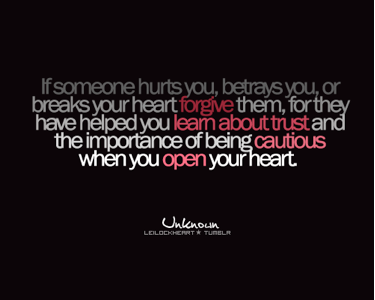 If someone hurts you, betrays you, or breaks your heart forgive them. If someone hurts you, betrays you, or breaks your heart forgive them, for they have helped you learn about trust and the importance of being cautious when you open your heart. In life there is a lesson to be learned in all of your victories and all of your defeats. Don't let things like failed relationships bring you down or stop you from ever wanting to trust another human being again. Forgive those who have abused your trust, those who are supposed to be with you but act as if they are against you, those who have been willing to not only break your heart, but willing to betray you as well. These are the people who have helped you the most, because these are the people who have taught you who and how to trust, when to be cautious, warning signs of someone who is becoming untrustworthy, and ultimately they have helped you to determine in the future who to open your heart to, and who not to as well. Live your life, don't let the feelings of hurt and pain live your life for you, use your wisdom from your experiences but never let them hold you back from seeing greatness.